A DIY Guide for the homeowner who wants to repair a cracked concrete floor. Most cracks in basement floors can be repaired by yourself with a do it yourself epoxy concrete crack repair kit. 1. Newly poured concrete shrinks when it dries. If no expansion joints are cut into the concrete floor then shrinkage cracks will likely appear. These are quite common. 2. The sub-base wasn't properly compacted and the concrete settled in one area causing the basement floor to sink and crack. 3. While under construction, the basement floor isn't heated in the winter and the dirt under the concrete freezes, causing it to expand. The sub-base heaves and lifts the basement floor, causing it to crack. There are some other reasons like, the concrete was poured too wet, or too much calcium chloride was added to the mix and it dried too fast, or the concrete was improperly cured. All these will lead to shrinkage cracking at some point. If you determine the cracks in your basement floor are due to settling or heaving, then that is a sub-base issue and the concrete may have to be removed to correct that issue. Repairing these cellar floor cracks will only be temporary if the concrete continues to move up or down. 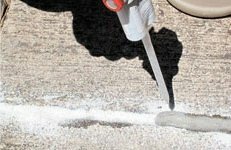 If you think the concrete floor is done moving, you can repair those cracks and the shrinkage cracks with an epoxy material you inject into the crack and add a silica sand for a filler. This will weld the crack together creating an excellent basement floor repair. Basic steps for repairing a basement floor crack. STEP 1. Clean out the cellar floor crack with a vacuum, remove any loose cement or aggregates. STEP 2. Inject the crack weld resin into the crack to wet it, it will soon get tacky. STEP 3. Push the dry silica sand into the crack to fill it. STEP 4. Thoroughly saturate the sand with the crack weld resin and fill it to the surface. STEP 5. In 10 - 15 minutes scrape the surface level with a putty knife. STEP 6. 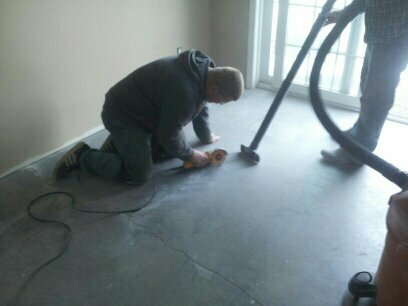 Sand the surface smooth or lightly grind it with a small concrete floor grinder for a neat appearance. Hairline concrete cracks can be done without the sand. Wide concrete cracks can first be filled partially with the sand then start with step 2. This crack weld material sets up very quickly, only do 10 - 15 feet at one time. 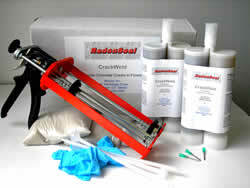 Radonseal makes a Do It Yourself basement floor crack repair kit that has all the repair materials included. They also have a couple of great videos that visually explain how to use this crack weld material. Watch this video of how to fix a basement floor crack! If you have a really wet basement with standing water and puddles click on BASEMENT FLOOR WATERPROOFING to learn how to fix having a wet basement. If your basement floor is just damp or moist click on WATERPROOFING BASEMENT FLOORS to learn how to have a dry basement. Click on BASEMENT FLOOR DRAIN to learn how to install a drain in your basement floor. To learn how to install insulation on top of your basement floor click on BASEMENT FLOOR INSULATION.